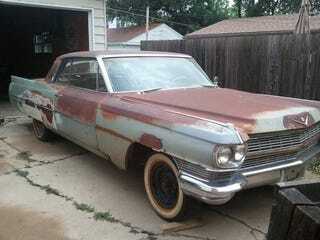 1964 Cadillac Coupe DeVille roller, $700. Look at that patina. Look at that interior. GM 6.2L diesel V8 w/transmission (700R4, presumably) from a wrecked Suburban, $600. This has the potential to be a fantastic low-money JaloProject. If I had space or the skills, I'd do it myself. Anyone want to build my dream for me? All links are from the Chicago area.